*OPEN BOX* * CUSTOMER RETURN* Y5 MILK IS THE FIRST ILLY IPERESPRESSO MACHINE WITH THE “ONE TOUCH MILK” OPTION FOR THE PREPARATION OF SIX BEVERAGES WITH A SIMPLE TOUCH. Experience the simplicity at home every day. 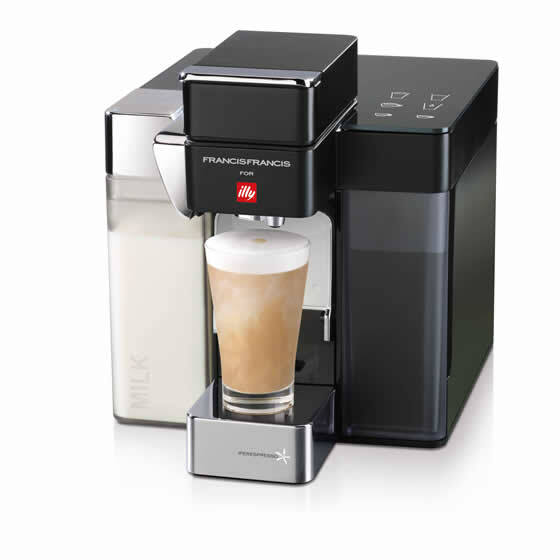 Y5 Milk is the first one touch milk illy iper Espresso machine allowing you to make cappuccino and latte macchiato with a single touch. Espresso and milk come together, for a variety of espresso based beverage options. Choose from a regular espresso to the creaminess of steamed milk, alone or with coffee. It also features the convenience of hot water for teas and herbal infusions. Its compact size, easy operational design, and removable milk tank make it the most versatile model of the whole range. For exclusive use with illy iperEspresso capsules only.